This is a private tour. You must be invited by the organizer or a group member to join this adventure. Head out with friends this summer as we build up to hiking Coliseum Mountain in September. Join the full series or just pick the dates that work best for you. Pick up some hiking tips and enjoy fun days on the trail with friends. Perfect for: Anybody looking for a fun day playing outisde. No hiking experience necessary. This is a private tour series. Contact us if you would like to organise something for your group. Sign up for all 5 hikes for $380 or pick individual hikes for $95 each. Each of the tours includes transportation from Red Deer, lunch, hiking poles and guide. Each of the tour leaves from our Basecamp + Cafe at 7:30 am (Survey Hill and Coliseum Mountain at 6:30 am). Please arrive 15 minutes early to check-in, fill the waiver and get ready for a day of adventure. We'll usually be back in Red Deer between 6 and 7 pm. The first hike of the series takes us along the Cline River Canyon and the Coral Creek Canyon to a lunch spot overlooking the broad Coral Creek valley above the canyons. We'll be hiking around 7 km on this hike on an easy to moderate trail. We'll start with the classic Siffleur Falls hike, taking in the views of the canyons and surrounding peaks before making our way up on the benches to a viewpoint overlooking the Kootenay Plains and North Saskatchewan River. This easy hike is a little longer than Coral Creek Canyon at about 10 km. We'll be doing 2 hikes on this tour, each a little over 4 km. 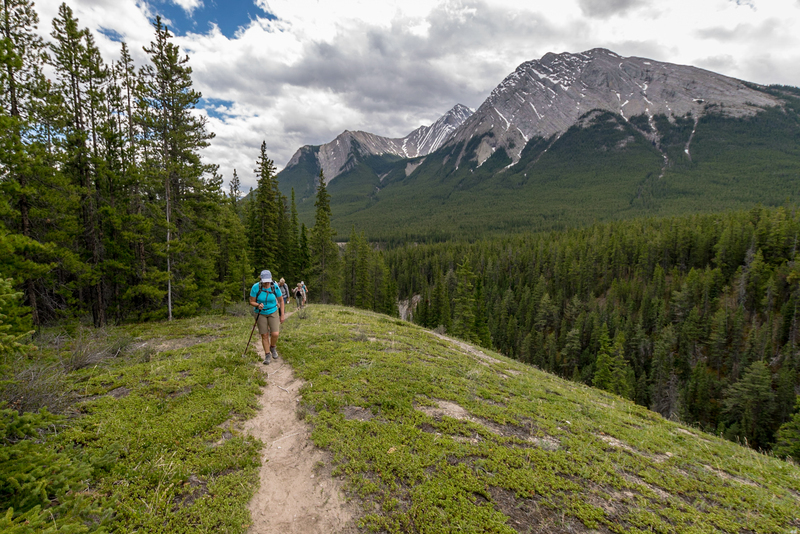 Our first stop is the popular Hoodoo Creek trail with the great views of Abraham Lake. The moderate trail follows the creek bed with a few sections requiring a little bit more effort than what we've seen so far. Our next stop is the pretty Whitegoat Falls, another 4 km hike with a double set of waterfalls waiting for us at the end and lots of Western Wood Lilies along the way. Our next hike is taking us along the North Saskatchewan River toward Preacher's Point and Abraham Lake. We're increasing the distance this month, heading out on an easy 16 to 18 km trail with ~110 metres of elevation gain. Departure time is 6:30 am. Return time is 6 pm. This hike is usually 6+ hours on the trail, including lunch. Our final hike is a 13 km moderate hike with ~700 metres of elevation gain taking us to the summit of Coliseum Mountain where we'll get to enjoy great views of Nordegg and the Rockies. Curious what you missed? Here's the highlights from some of the past tours. 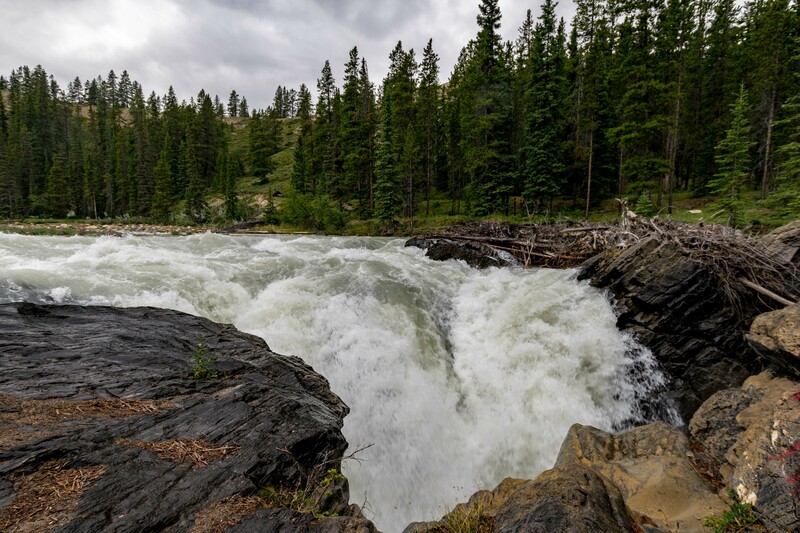 The second hike in our private monthly hiking series took us on the classic Siffleur Falls hike followed by a detour up on the benches along the Siffleur River to a viewpoint overlooking the North Saskatchewan River, the Kootenay Plains and the main range of the Rockies. We have the pleasure of running a private monthly hiking series for a group of ladies this summer. The first hike of the season took us along the Cline River Canyon and Coral Creek Canyon on an easy to moderate 7 km hike. 47 Street will be closed for the rest of the summer. Use 45 Street to access Cronquist Business Park for now. Gourmet lunch and trail snacks. What kind of lunch is included? Can special diets be accommodated? Lunch for this adventure includes the choice of a veggie (hummus, lettuce, tomato, cucumber and green pepper on a Montreal style bagel), Angus beef sandwich (roast beef, provolone cheese, lettuce, tomato and green pepper with BBQ sauce on a Montreal style bagel) or honey maple turkey sandwich (honey maple turkey, Boursin cheese, lettuce, tomato, cucumber with deli mustard on a Montreal style bagel), juice box, veggies and hummus, fruits and dessert. Please make sure to mention any dietary requirements when you book your adventure and we will try to accommodate whenever possible. The standard group size is 1 guide with up to 12 guests for this tour. This tour is recommended for those 18 and older. Transportation varies with the group size and can be in an SUV, mini-van, full size van or small bus depending on the day.